I have learned how to make the best cake recipes. I started baking cakes when I was very young. As soon as I learned how to make cookies, I was ready to move on to conquering the cakes. Since that time I have collected many recipes for cakes. When I am looking for a new cake to try, there are certain ingredients that I look for that I love in a cake recipe. Of course it varies somewhat from one type of cake to another; for instance if it is a sponge cake, angel food, layer cake or pound cakes. When I learned how to make the best cake recipes I found one basic quality in all is that they must be moist. Even cakes like sponge and angel food; I have tasted some very dry ones. Dry cakes usually mean that the percentage of flour is too high for the other ingredients; this is something I look for. Some other ingredients I look for in a recipe which add to the moistness are buttermilk, sour cream, sour milk, oil, fruits and vegetables. If you think vegetables sound funny but think about the delicious carrot cake. Many vegetables when grated help hold moistness in the cakes while also adding flavor. Saying that I like moistness in my cakes is not saying that I like heavy cakes. 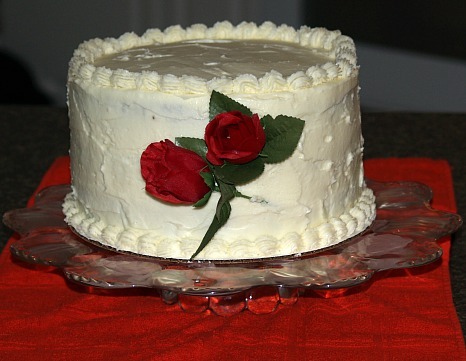 When I was learning how to make the best cake recipes I realized that each must have a good balance. I do not like real heavy cakes but also I do not like ones which are so light that they fall apart when you cut them. This is a balance which I find often lacking in making a good white cake recipe. For this balance you must consider the leavening and the amount in the recipe compared to the other ingredients. One thing to remember if you find a recipe with buttermilk, sour cream or sour milk, these recipes must have some baking soda in the recipe to enable the leaving power. Recipes without these ingredients might get by with only baking powder added; the two work in different ways. Once you have selected the recipe you want to try, read through it thoroughly. Make sure you have all the right ingredients, utensils and pans to make it. Remember also when it comes to ingredients, the best ingredients make the best cake recipes. While mixing and baking the cake, follow the directions very closely. The mixing of the cake also requires a good balance; not too much but must be enough. The recipe will usually point you to how much mixing time is needed. Baking is another pivotal part of preparing the best cake recipes. Read the directions for proposed timing but keep in mind all ovens are different so have your tester ready for accuracy. One last note, it is good to keep an oven thermometer in your oven and periodically check for accuracy of your oven temperature. This is one of the best cake recipes that I have made. Grease 2 eight inch cake pans, line with wax paper then grease and flour again. Cream sugar and shortening until light and fluffy; beat in vanilla. Sift cake flour, salt and baking powder; add alternately to cream mixture with milk. Pour batter evenly into prepared pans; bake 25 to 30 minutes or until pick comes out clean. Cool 5 minutes before removing from pans; cool completely on rack. Fill with lemon cake filling; frost with white frosting and sprinkle with coconut. This filling goes very well with some of the best cake recipes. Combine sugar and cornstarch in saucepan; gradually add boiling water. Slowly add the beaten egg yolks while briskly stirring. Add lemon juice and butter; cook over medium stirring constantly until thickened. Cool thoroughly before filling cake. NOTE: With pastry bag, I pipe a ring around top outside of bottom cake layer before adding the filling. It prevents the filling from running down the sides. Frost top and sides of cake with favorite white frosting; sprinkle with coconut. In small mixing bowl let egg whites warm to room temperature. Combine sugar, salt, vinegar and water in saucepan. Cook and stir over medium heat until sugar dissolves and syrup is clear. Continue cooking over medium without stirring until candy thermometer reaches 242F degrees. Beat egg whites on medium speed until soft peaks form when beater is lifted. Increase mixer speed to high and gradually pour in hot syrup in a thin stream over egg whites. You can also use the frosting recipe below instead of the recipe above. I use to think this frosting made the best cake recipes; it was just about the only kind my family used when I was young. Combine unbeaten egg whites, corn syrup, sugar and salt in top of double boiler; beat until mixed. Place over rapidly boiling water and cook, beating constantly. Beat with hand mixer until frosting stands in stiff peaks. Remove from heat and continue beating about 1 minute longer; add vanilla. Preheat oven to 350F degrees; grease and flour 3 eight inch cake pans. Combine cooking oil and sugar; beat until smooth. Add egg yolks to sugar mixture; beat in hot water. Sift together cake flour, baking powder, salt, cinnamon and nutmeg; blend into creamed mixture. Stir in potatoes, nuts and vanilla. Divide evenly among 3 prepared pans; bake about 25 to 30 minutes or until pick comes out clean. Let cakes set 5 minutes; remove from pans to rack to cool completely. Frost with following coconut frosting recipe. Combine milk, sugar, butter, egg yolks and vanilla in saucepan. Cook over medium heat about 12 minutes stirring constantly until thickened. Remove from heat and stir in coconut; beat until cool and have spreading consistency. 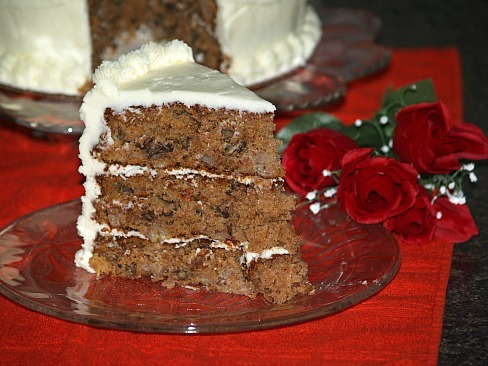 HUMMINGBIRD CAKE RECIPE This is one of the best cake recipes. Many people consider this to be the best cake recipe. Preheat oven to 350F degrees; grease and flour 3 nine inch cake pans. Stir in pineapple, vanilla, nuts and bananas; spread batter evenly into prepared pans; about 4 1/4 cups of batter per pan. Bake about 35 to 40 minutes or until pick comes out clean; remove to rack to cool completely. Spread frosting with following recipe between layers, on sides and on top; sprinkle top with pecans. Combine cream cheese and butter; cream until smooth. Beat in powdered sugar and vanilla until creamy and smooth; spread on cake.